Gigabyte doesn’t officially release its laptops in this country but it has teamed up with distributor Expansys to make the Gigabyte W565 (£389 inc. VAT) available. This entry-level machine has a rather plain and basic chassis design that is made of tough plastic. The grey and black finish is rather business-like and, aside from the power button, the only ornamentation is a Wi-Fi on/off switch. The machine is slim and, weighing 2.6kg, can easily be slipped into any standard laptop case. Semi-portable it may be, but with a battery life of a mere 88 minutes, this isn’t a great machine to use on the move. The type of user who will make the most of this machine is someone working at home who is looking to carry out a number of simple tasks. The screen is a 15.4-inch Super-TFT panel that proved exceptionally bright and is certainly on a par with most rival laptops. The GPU is an integrated Intel solution and proved decidedly slow in 3D tests. While it is adequate for basic tasks, it won’t deliver multimedia graphics. The keyboard sits in the centre of the main body and, while the keys are of a good size, the individual keys have a degree of rattle when you type. On the plus side, the secondary keys are large, making it a reasonably comfortable board to use. The touchpad is on the small side but proved accurate, as are the mouse buttons. At this price point you’ll find the specification is an Intel Celeron M 550, which is a 2GHz chip and considerably quicker than the one found in the Asus Eee PC 900. With 1024MB of memory, applications load reasonably well and we found the whole system adequate for basic daily tasks. 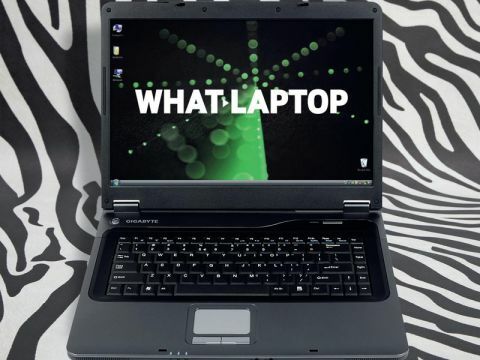 One of only two laptops in this test to run Windows Vista instead of the older Windows XP, you’ll find this is the Basic Edition, which is fine for running on such a basic platform as this. We found the machine ran reasonably quickly and stayed relatively cool to the touch, even after long periods of use. When it comes to extras, you won’t find too many fitted. With three USB ports – two of which are located on the rear of the case – a memory card slot, VGA-out port, Ethernet and modem being the sole connections, adding peripherals is typical for a budget machine. The optical drive is a dual-layer DVD rewriter. The Gigabyte W565 is a good example of what you can expect from a budget laptop. While there is nothing inherently wrong with the design or performance of this machine, other than a poor battery life, we found it was out-performed by several rival machines.